While SEO is definitely not going away either, some of the usual tactics are outdated. 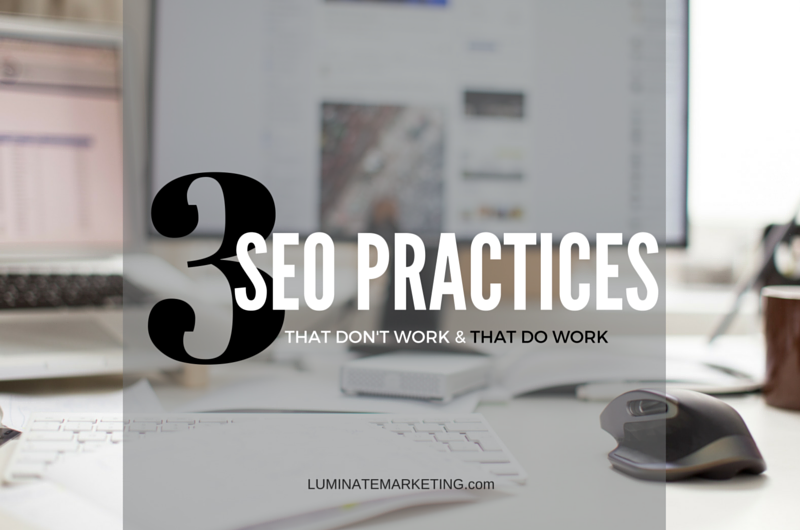 Here are 3 SEO practices you should not be doing anymore. It used to be that paying for backlinks, backlink exchanges, or creating mass amounts of backlinks to your site would give your site drastic increases in ranking. Those days are now long gone. This was a lazy way of creating backlinks and Google is quick to penalize anyone still practicing this outdated SEO method. With the release of the latest Penguin update, if your site has any links created from these methods, we strongly suggest getting them removed or disavowed immediately to prevent being penalized. You don’t want that! Ever seen a webpage that says “Chicago marketing in Chicago for Chicago Marketers…” Yes? This is keyword stuffing. Keywords once had a huge impact on search ranking. But now that Google’s algorithm is much more advanced, Google sees when someone is trying to play the system. And then it penalizes them. Keywords are still important, but not as important as they once were. You should be using appropriate keywords, though in a way that looks natural/appealing to a user. People are going to decide whether or not they want to click on your site so market to them, not search engines. “Content is king!” Yes, I’m tired of that phrase too, but it’s actually true. At one time creating as much content as possible for the sake of creating content was a viable SEO tactic. Now it’s not how much content you have but the quality of the content. As said before, you are marketing to people and people don’t want to read boring articles created just because some marketer said, “Content is king!”. People want to read content that is engaging, so do just that instead of stuffing pages with useless materials. With all of these old SEO practices no longer useful, what are some classic SEO tactics that still work? Largest Selection of Chairs for Your Every Need | The Chair Store = GOOD! One looks spammy, the other is written to a human being. Which would you rather click on? How long are you willing to wait for a site to load? People are 90% more likely to abandon a website if it takes longer than 3 seconds to load! Not only that but when search engines crawl websites, they will only wait so long for a page to load before abandoning it. So to sum it up, a slow website will risk not getting crawled by search engines and people don’t have the patience to wait for a slow site to load. Increasing the load time of your website is enabling our society’s lack of patience but it is a good SEO tactic, so go ahead and speed up your site. Learn patience in the long Starbucks line instead. Creating fresh, good quality content is still one of the best SEO practices you can do. Quality content allows people to engage with your site, and encourages others to share and link to your content. It also shows search engines that you’re not just creating random content but content with a purpose, which Google loves. And so do we. All these things make your site look more valuable and credible to search engines which in turn increases your search rank. Remember though, content needs to be “fresh” and “valuable”. Copying and pasting that blog post from 2011 won’t win you any points with Google. Put in that little extra work, we promise it will go a long way. SEO is still very necessary but the old ways of doing things aren’t. SEO is evolving so be sure to stay up to date with what counts now.